If your blood pressure is anything over the normal reading of 120/80 mmHg, a stroke may be in your future -- even if it's not high enough to be considered hypertension. That's what a new study published March 12 in Neurology suggests. Researchers analyzed data collected on 760,000 people, and found people with "prehypertension" were 66 percent more likely to develop a stroke than people with a normal blood pressure reading. Prehypertension is a blood pressure that's higher than 120/80 mmHg, but lower than the high blood pressure (hypertension) threshold of 140/90 mmHg. Twenty percent of all strokes seen in the study were among people with prehypertension. The raised risk remained even after ruling out other factors that could lead to a stroke, including high cholesterol, diabetes and smoking. A closer look found people with blood pressure over 130/85 mmHg (but still less than the "high" 140/90 mmHg) were 95 percent more likely to develop a stroke than people with normal blood pressure, while prehypertensives lower than 130/85 were 44 percent more likely to have a stroke than someone with a normal 120/80 mmHg reading. The study has important takeaways for the public, according to the researchers. "Considering the high proportion of the population who have higher than normal blood pressure, successful treatment of this condition could prevent many strokes and make a major difference in public health," study author Dr. Dingli Xu, a blood pressure researcher at Southern Medical University in Guangzhou, China. About one in three Americans have high blood pressure, which increases risk for heart disease and stroke - two leading causes of U.S. deaths. Risk factors include high sodium intake, obesity, a sedentary lifestyle, family history of stroke and advanced age. 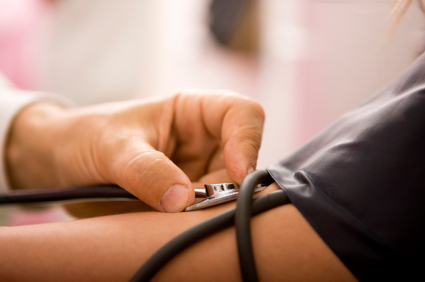 Lifestyle changes and medications, such as statins, may reduce blood pressure for someone with high blood pressure. But blood pressure medications aren't recommended for people with prehypertension, Xu pointed out, because not much research has looked at whether the drugs could be safe and effective for this group. Thus, diet and exercise are the best ways to reduce stroke risk among people with prehypertension, he said. Strokes are a leading cause of death and disability in the United States. Strokes affect more than 795,000 people in the U.S. and kill about 130,000 people each year, according to Centers for Disease Control and Prevention estimates -- about on out of every 19 U.S. deaths. Stroke risk typically doubles for each decade between ages 55 and 85, but last year researchers reported a "startling" 25 percent rise in strokes in younger adults between 20 and 64 years old over the past two decades. The ongoing obesity epidemic, along with diabetes and high blood pressure caused by the extra weight were thought to make younger people more susceptible to stroke. Some recent research has added that the risk can start early, and children may be at risk for elevated blood pressure and eventual cardiovascular problems from eating too much sodium. The American Heart Association estimates more than 90 percent of kids eat too much salt. One expert said the study suggests more research needs to be done looking at whether medications could prevent stroke in people without high blood pressure. "I think if you were to consider prehypertension... as a risk factor for stroke, then you are dealing with millions of Americans," Dr. Jahandar Saleh, chief of cardiology at Northridge Hospital in Northridge, Calif., told CBS News' Teri Okita. To prevent a stroke, you should keep your blood pressure low, lose weight, exercise more, drink only in moderation, take baby aspirin (check with doctor if it's appropriate for you), quit smoking and get other health conditions like diabetes and atrial fibrillation under control, Harvard Medical School suggests.